Although if old paintings are to be trusted, there have been spotted pigs around for two or three centuries, the Gloucestershire Old Spots has only had pedigree status since the early 20th century. 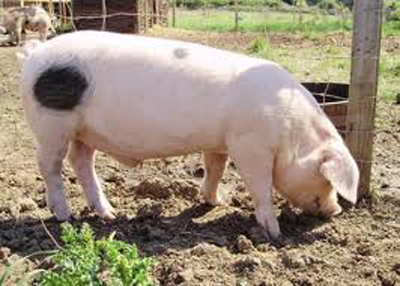 They had been set into type for some time and were very popular in the Berkeley Vale of Gloucestershire where they were known as the Orchard Pig. They grazed in the apple orchards, clearing up the windfalls as well. They lived outside throughout the year being tough and hardy although also quiet and easily handled. These qualities are prominent today. The Gloucestershire Old Spot is a large meaty animal with a broad and deep body and large hams. Its white coat has large clearly defined black spots. A few years ago fashion called for only one or two spots but today breeders have decided that if you are going to have a spotted pig, then it should have more spots. The spots should, however, be clearly defined and black but not blue. Their legs and feet should be strong and straight and their ears should be lop ears covering their faces and coming down to their noses. They are ideally suited to an outdoor system. Provided they have a warm and comfortable hut they will thrive outside all the year around, better on land that is reasonably dry so that it does not become a quagmire. This the pigs wouldn’t mind, but it would become difficult to get round to look after them.